NOTICE: If your updating to 3.0 from a previous version, make sure to delete your current version from your AddOns' folder first. This is just a simple experience bar addon I wrote, all of the configuration is done through the Config.lua file. There you can change the font, texture, anchor, and size of the bar. 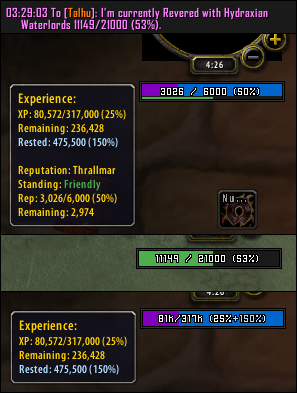 When your not level 80 and your tracking a reputation, it will show the reputation info on the tooltip, and will push the xp bar up 2 pixels to show a reputation bar. When you right click on the bar, it will open a menu to report reputation/experience information into chat. That's it, hope you enjoy the addon! Renamed global variable "st" to "stExp" to prevent it from conflicting with a variable in Tukui. Removed Monochrome from the outline when not using my edit of Tukui. Redesigned configuration a little, and added Tukui v13 compatibility. 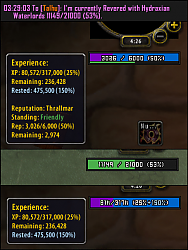 Rewrote the entire addon again, and also added a new bar for guild exp and rep.
Re: Error upon logging in since MOP. I'm at max level (100), and the error only appeared when I didn't have a faction tracked. Been getting this since MOP. Doesn't seem to mess with gameplay, but getting annoying with the reports. No response from the author's portal, might as well try my luck here. Error upon logging in since MOP. Help please. I'm not sure how to fix this. (*temporary) = "%d / %d (%d%%)"
I'm trying to edit the colours for reputation to make them brighter, and for some reason the changes to the colours aren't actually taking place. The colors you're changing (the hex codes at the end) are for the color shown in the tooltip, the ###/### towards the front of each line are the RGB values for the color shown on the bar. So to change a bar color you need to alter the RGB values and the tooltip values - although, Im unfamiliar with the color code used for the tooltip color and the regular hex codes don't work. changes the bar color, but not the tooltip color (because I can't figure it out =\). Last edited by Althathwe : 04-18-11 at 07:32 AM. this mod really needs ingame config menu were you can lock, unlock, scale, change color, font, split into 2 bars (xp and rep). can sum 1 tell me how to change the width of the bar? Just uploaded a working version with stMedia. Hopefully this will solve all the issues. Last edited by tinyu : 03-13-11 at 10:34 PM.